January 27, 2011 - Discovery Air Technical Services (DATS), a Discovery Air company, announced it has received its Approved Maintenance Organization (AMO) Certificate from Transport Canada for the SAAB 340 aircraft. DATS is also announced that it has signed maintenance agreements for multiple aircraft with Sky Bahamas, a Caribbean operator based in Nassau, The Bahamas, and Transwest Air, a Canadian operator based in Prince Albert, Saskatchewan. "The DATS technicians are outstanding. Their knowledge, motivation, and problem solving skills have allowed us to maintain a challenging flight schedule. The experience was positive for Sky Bahamas and I would recommend Discovery Air Technical Services for your Saab 340 maintenance needs. Sky Bahamas plans to continue their use as the need arises." With 48 various aircraft and helicopters, Transwest Air is Saskatchewan's largest and longest operating airline, providing scheduled passenger and freight service to Saskatoon, Prince Albert, La Ronge, Stony Rapids, Fond du Lac, Wollaston, Points North, and Fort McMurray, Alberta. Transwest Air also offers fixed wing and rotary wing charter services, and operates a float plane base in Lynn Lake, Manitoba. "We are delighted that our Saab 340 heavy maintenance service has launched with two important customers like Sky Bahamas and Transwest Air,'' said Remy St-Martin, Vice President Commercial Services. "We're getting outstanding customer feedback regarding our employees' expertise and quality service orientation, and we are fully committed continuing to exceed our customers' expectations." In addition to the Saab 340, Discovery Air Technical Services holds Transport Canada approvals for the DASH-8, ERJ 135/145 and Boeing 737 aircraft, and will soon add additional aircraft types. DATS' Quebec City maintenance facility provides a wide range of services including welding, avionics, engineering, machining, heat treatment, composite and sheet metal repairs. Founded in 2004, Discovery Air Inc. is a specialty aviation services company operating across Canada and in select locations internationally. With over 140 aircraft, it is one of the largest air operators in Canada, employing 450 flight crew, maintainers and support staff to deliver a variety of air transport, maintenance and logistics solutions to a wide range of government, airline and business customers. The Company's Government Services segment includes two subsidiaries: Top Aces Inc., which delivers airborne training and special mission services to the Canadian military, and Hicks & Lawrence, a supplier of airborne fire management services to the Ontario government and charter services to government agencies and corporate customers. The Company's Northern Services segment includes three subsidiaries: Great Slave Helicopters, the second-largest VFR helicopter operator in the country. Air Tindi, a fixed-wing aircraft charter provider operating throughout Northern Canada; and Discovery Mining Services, which constructs and rents all-weather exploration camps and provides expediting and logistics support services. Discovery Air also provides a range of maintenance, repair and overhaul solutions to airline customers through Discovery Air Technical Services Inc., based in Quebec City. The Saab 340 is a discontinued Swedish two-engine turboprop aircraft designed and initially produced by a partnership between Saab and Fairchild Aircraft in a 65,35 ratio. Under the initial plan Saab built the all aluminum fuselage and vertical stabilizer, and also performed final assembly in Linköping, Sweden, while Fairchild was responsible for the wings, empennage, and wing-mounted nacelles for the two turboprop engines. After Fairchild ceased this work, production of these parts was shifted to Sweden. 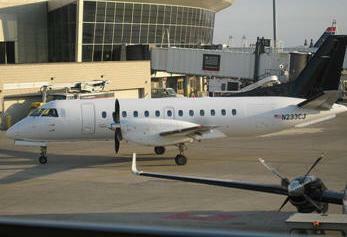 The aircraft first flew on 25 January, 1983, but due to declining sales, production of the Saab 340 ended in 1998. Originally designated as the SF340, the aircraft first flew on 25 January 1983. When Fairchild exited the aircraft manufacturing business in 1985 after about 40 units, Saab dropped the name Fairchild from the project and continued aircraft production under the designation Saab 340A and 159 A models were built. An improved version, the second generation 340B, introduced more powerful engines and wider horizontal stabilizers in 1989 and the later 340Bs also had an active noise control system. Two hundred aircraft were built. The final third generation version, the 340B Plus, was delivered for service in 1994 and incorporated improvements that were being introduced at the same time in the Saab 2000. One hundred aircraft were built adding up to a total of 300 B models. The production run of Saab 340s typically seated between 30 and 36 passengers, with 34 seats being the most common configuration. The last two 340s built were constructed as older configuration 36-seat aircraft for Japan Air Commuter. As of June 2009, Saab Aircraft AB reports there were 413 Saab 340s in service with 61 operators in 30 countries having accumulated 13,499,000 flight hours on over 15 million flights. SAAB is considering extending the airframe lifespan, which initially was 60.000 hours and 90.000 cycles, up to 75,000 hours. The highest time aircraft in the fleet (-028) has reached 55,495 hours as of October 2010.